The word "elephant" has both Greek and Latin origins. This applies specifically to the elephant´s scientific genus name "Elephas". In Greek linguistics, elephos represents an antlered beast or stag. The roots of the word "elephant" in latin is divided into two words; ele means arch and phant means huge. Also, the genus name Loxodonta, for the African elephant means losenge-shaped teeth for the chewing surfaces. The modern-day African and Asian elephants belong to the order Proboscideahas.The three living species that exist today are: the African Bush (Savannah) Elephant, the African Forest Elephant , and the Asian Elephant. 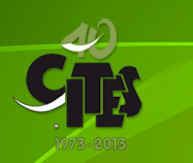 In the past there were some 350 members in this order, but over time the majority of the members succumbed to extinction. But, much like their predecessors, these species are facing a grim future that is heading very near to another man-propelled extinction. Throughout history, the elephant has played an important role in human economies, religion, and culture. The immense size, strength, and stature of this largest living land animal has intrigued people of many cultures for hundreds of years. In Asia, elephants have served as beasts of burden in war and peace. Some civilizations have regarded elephants as gods, and they have been symbols of royalty for some. Elephants have entertained us in circuses and festivals around the world. For centuries, the elephant's massive tusks have been prized for their ivory. The African elephant once roamed the entire continent of Africa, and the Asian elephant ranged from Syria to northern China and the islands of Indonesia. These abundant populations have been reduced to groups in scattered areas south of the Sahara and in isolated patches in India, Sri Lanka, and Southeast Asia. Demand for ivory, combined with habitat loss from human settlement, has led to a dramatic decline in elephant populations in the last few decades. In 1930, there were between 5 and 10 million African elephants. By 1979, there were 1.3 million. In 1989, when they were added to the international list of the most endangered species, there were about 600,000 remaining, less than one percent of their original number. Asian elephants were never as abundant as their African cousins, and today they are even more endangered than African elephants. At the turn of the century, there were an estimated 200,000 Asian elephants. Today there are probably no more than 35,000 to 40,000 left in the wild. Elephants are considered a keystone species in the African landscape. They pull down trees, break up bushes, create salt licks, dig waterholes, and forge trails. 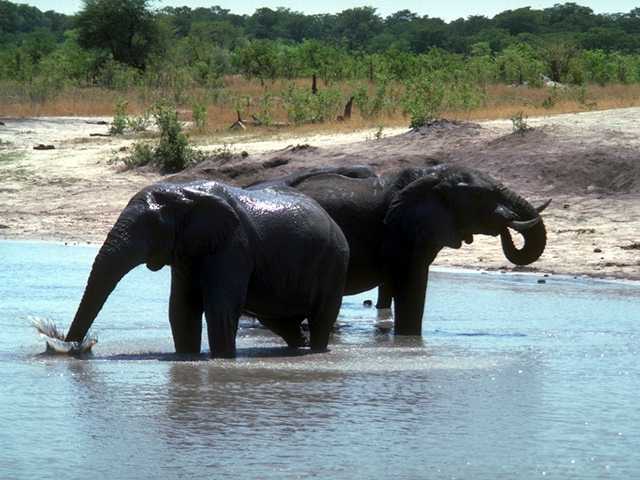 Other animals, including humans, like the pygmies of the Central African Republic, depend on the openings elephants create in the forest and brush and in the waterholes they dig. Even elephant droppings are important to the environment. Baboons and birds pick through dung for undigested seeds and nuts, and dung beetles reproduce in these deposits. The nutrient-rich manure replenishes depleted soil. Finally, it is a vehicle for seed dispersal. Some seeds will not germinate unless they have passed through an elephant's digestive system. • Elephants essentially walk on tiptoe because of the way their feet are formed. A tough and fatty piece of connective tissue forms the sole. •The elastic, spongy cushions on the bottom of elephant feet act as shock absorbers and help elephants move silently. • Toes are buried inside the flesh of the foot and not all toes have toenails. • Africans have four toenails on the front feet and three on the back; Asians have five on the front and four on the back. • The circumference of the forefoot is equal to about half the shoulder height. • The pattern of ridges and fissures left behind by an elephant footprint is as distinctive as our fingerprints. • Front feet are more circularly formed, back feet are somewhat oval in shape. • Elongated oval prints usually indicate an adult male. • Elephants drink by filling their trunks with water and then pouring the water into their mouths. • African elephants have two fingers on the tip of their trunks, Asians have only one finger and typically use their trunks only to scoop objects up with. Calves can lift about 4.5% of their own weight with their trunks. • Elephants can use their trunks for water storage, for sucking up mud and dust to cool off with, and for friendly wrestling matches. • When elephants sense danger they will raise their trunks to smell any threat. • An elephant charging with its trunk held high is generally bluffing. If the trunk is tucked down, the elephant means business. • African elephant ears are at least three times the size of Asian elephant ears. African elephants use their ears as signaling devices and as protective devices to ward off threats. • Ears are used to regulate body temperature in both species. The elephants' surface area is small in comparison to their total mass, making it difficult to release excess body heat. Their large, veiny ears act like a radiator; when flapped, the blood flowing through them is cooled, helping to regulate the elephants' body temperature. Every elephant’s ear is unique and is often used for identification purposes (much like a fingerprint). • Ear flaps are made of cartilage with thin skin closely attached and are very soft and sensitive. • Elephant ears have infrasound capabilities for long-range communication. The world's largest living land mammals are best known for their huge size, unique body parts, social behavior, and longevity. Physical Description: Two African elephant species are recognized: the larger and more widespread savanna elephant (L. africana) and the forest elephant (L. cyclotis), which is smaller, has downward-pointed tusks, and smaller, rounder ears. Some genetic evidence suggests there may be a third species, the west African elephant, intermediate to these two. 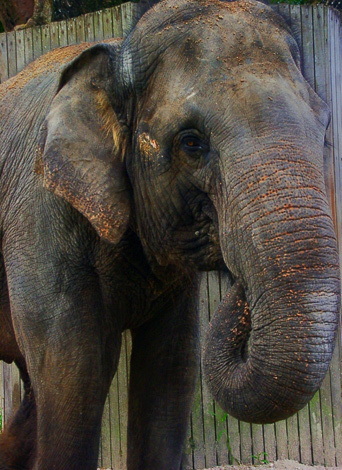 The animals' trunks, unique among living mammals, are versatile, enabling elephants to manipulate tiny objects or tear down huge tree limbs. Wide, padded feet enable elephants to walk quietly. Large, flappable ears help these huge animals to cool off, although elephants often must retreat to the shade or water during the hottest part of the day. Size: Male African elephants of the savanna species grow up to 25 feet long, stand up to 11 feet tall and weigh up to 14,000 pounds. Males are usually larger than females. Geographic Distribution: African elephants live in many parts of sub-Saharan Africa, although their range is now broken into patches. Small numbers of forest elephants live in dense equatorial forests of Central Africa from Zaire west to Mauritania, while savanna elephants are far more widespread in drier woodlands and savannas. Savanna elephants are now most common in Kenya, Tanzania, Botswana, Zimbabwe, Namibia, and South Africa. The suspected third species lives in both savanna and forest in west Africa. Status: African elephants are listed as endangered on the World Conservation Union's Red List of Threatened Animals. Habitat: African elephants live wherever they can find enough food and water with minimal disturbance from people. 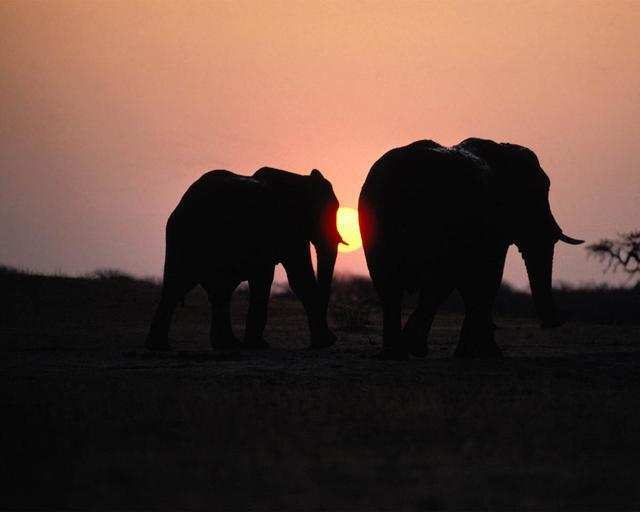 Most of the continent's elephants live on savannas and in dry woodlands. In some regions, they occur in desert areas; in others, they are found in mountains. In Congo and other equatorial countries, forest elephants live in dense tropical rainforest. Natural Diet: A dexterous trunk and large, rasping molars allow African elephants to gather and process a wide variety of vegetation. During the rainy season, savanna elephants usually seek out grasses and herbs. During other times of year, they frequent forests, especially those by streams, where they also eat leaves, fruit, and bark from a variety of plants. Elephants supplement the sodium in their food by visiting mineral licks. Reproduction: Older and larger males—especially those in musth (condition of heightened testosterone levels)—dominate the breeding, winning the acceptance of females in heat. Gestation lasts 22 months, and usually only one calf is born. Female African savanna elephants can usually breed by age ten and give birth to one young every four years. 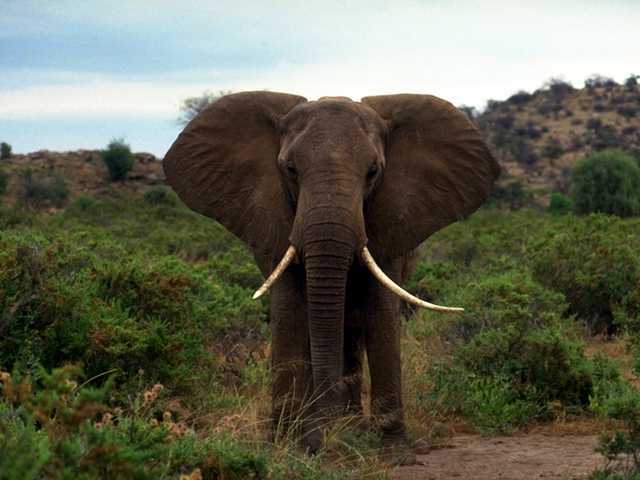 Life Span: The average life span of an African savanna elephant in the wild is 60 years. Behavior: Females and young males live in cohesive herds of about ten related adults and their offspring. The matriarch, usually the oldest and largest female, sets the pace of the group's activities. Males leave herds at puberty, around their 13th year, and travel alone or in bachelor groups. Elephants travel widely in search of food. Movements vary depending upon food availability. African elephants communicate with rumbles, growls, bellows, and moans. Some of these varied, low-frequency sounds may travel a mile or more. Giant herbivores, Asian elephants can tear down huge tree limbs or pick up small objects with their muscular trunks. Physical Description: Asian elephants are huge gray animals inhabiting Asian tropical forests. Their gray coloration conceals them in their shady habitat. Elephants' trunks, unique among living mammals, are versatile, enabling them to reach the ground, manipulate tiny objects or tear down huge tree limbs, squirt water over their backs or into their mouths, or blow dirt onto their backs during dust baths. Female Asian elephants usually lack visible tusks as do males in some populations, such as those in northeast India. Wide, padded feet enable them to walk quietly. Large, flappable ears help these huge animals cool off, although elephants often must retreat to the shade or water during the hottest part of the day. Size: Asian elephants grow up to 21 feet long, stand up to 10 feet tall, and weigh up to 11,000 pounds. Females reach around eight and a half feet tall and weigh less than males. Despite their size, elephants are able to walk silently. Geographic Distribution: Asian elephants live in large blocks of forest near water sources and grasslands, habitat that has been greatly reduced in the last half century. They inhabit India, Sri Lanka, Myanmar (Burma), Indonesia, Thailand, Cambodia, Vietnam, Laos, Malaysia, Nepal, Bangladesh, and southern China. Status: The Asian elephant is listed as endangered on the World Conservation Union's (IUCN's) Red List of Threatened Animals. Habitat: Asian elephants inhabit a variety of tropical forest habitats from moist, evergreen lowland forest to dry semi-deciduous teak forests to cooler mountain forests up to 10,000 feet. They also frequent adjacent grasslands and farm areas. Their varied diet enables them to live in disturbed forests as long as they have plenty of space to move around and exploit different foods without coming into conflict with people. Natural Diet: A dexterous trunk and large, rasping molars allow Asian elephants to gather and process a wide variety of vegetation, including grasses and herbs, leaves, fruit, farm crops, and bark. Reproduction: Older and larger males—especially those in musth (condition of heightened testosterone levels) dominate the breeding, winning the acceptance of females in heat. Gestation takes 20 to 22 months, and usually only one calf is born. Female Asian elephants can usually breed by age 14 and usually give birth to one young every four years. Life Span: In the wild, Asian elephants may live up to about 60 years but most do not live that long. Behavior: Female and young male Asian elephants live in cohesive herds of related adults and their offspring. The matriarch, usually the oldest and largest female, sets the pace of the group's activities. Herds often join with others to form large groups called clans. Males leave herds at puberty, around their 13th year, and travel alone or in bachelor groups. Elephants wander widely in search of food. Movements vary widely depending upon food availability. Asian elephants communicate via rumbles, growls, bellows, and moans. Some of these varied, low-frequency sounds may travel a mile or more. Elephants need a large amount of habitat because they eat so much. Humans have become their direct competitors for living space. Human populations in Africa and Asia have quadrupled since the turn of the century, the fastest growth rate on the planet. Forest and savanna habitat has been converted to cropland, pastureland for livestock, and timber for housing and fuel. Humans do not regard elephants as good neighbors. When humans and elephants live close together, elephants raid crops, and rogue elephants (aggressive male elephants during the breeding season) rampage through villages. Local people shoot elephants because they fear them and regard them as pests. Some countries have established culling programs: park officials or hunters kill a predetermined number of elephants to keep herds manageable and minimize human-elephant conflicts. Hunting has been a major cause of the decline in elephant populations. Elephants became prized trophies for big-game hunters after Europeans arrived in Africa. More recently, and more devastatingly, hunters have slaughtered elephants for their ivory tusks. The ivory trade became a serious threat to elephants in the 1970s. A sudden oil shortage caused the world economy to collapse, and ivory became more valuable than gold. In fact, ivory has been called "white gold" because it is beautiful, easily carved, durable, and pleasing to the touch. Most of the world's ivory is carved in Japan, Hong Kong, and other Asian countries, where skilled carvers depend on a supply of ivory for their livelihoods. Hunting elephants is no longer legal in many African countries. For many the high price of ivory is too tempting to resist. Local people often had few other ways to make a living, and subsistence farmers or herders could make more by selling the tusks of one elephant than they could make in a dozen years of farming or herding. As the price of ivory soared, poachers became more organized, using automatic weapons, motorized vehicles, and airplanes to chase and kill thousands of elephants. To governments and revolutionaries mired in civil wars and strapped for cash, poaching ivory became a way to pay for more firearms and supplies. Poaching has caused the collapse of elephants' social structure as well as decimating their numbers. Poachers target the biggest elephants because their tusks are larger. They often kill all the adults in the group, leaving young elephants without any adults to teach them migration routes, dry-season water sources, and other learned behavior. Many of Africa's remaining elephant groups are leaderless subadults and juveniles.